Ionic Air Purifiers Vs. HEPA Purifiers - What's The Difference? Home » Information » Ionic Air Purifiers Vs. HEPA Purifiers – What’s The Difference? 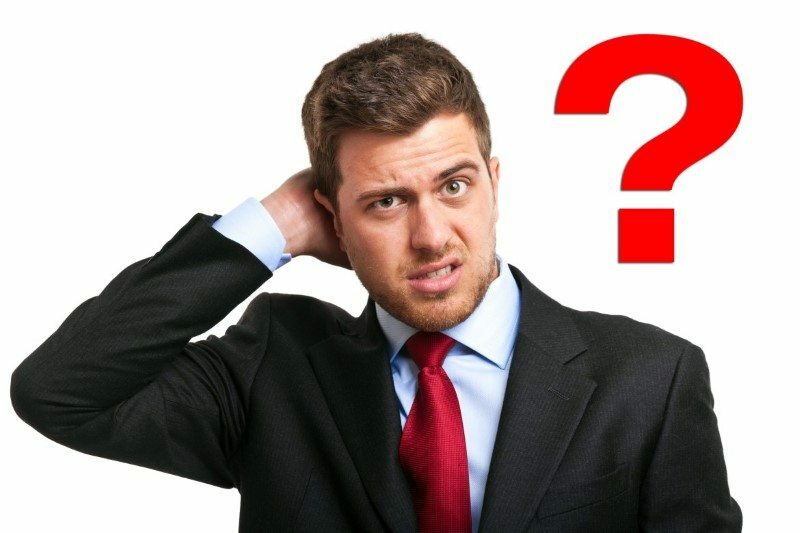 Are you trying to understand the difference between an ionic air purifier vs. a HEPA purifier? I’ll be honest and admit a long time ago I was confused too. One reason is because of misleading product descriptions I had to research and verify. It seems like there are so many products sold today as air purifiers. And many are falsely described – which makes it even more confusing! 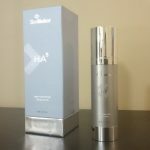 My main objective is to answer your questions about both the differences between an ionizer purifier vs. HEPA purifier. Before spending any money it’s well worth taking a few minutes to find out more what you really need. I want you to get the best for your money and the best product for your needs. I’ve included comparisons and suggestions for what type is best at the bottom. What does an ionic purifier do? 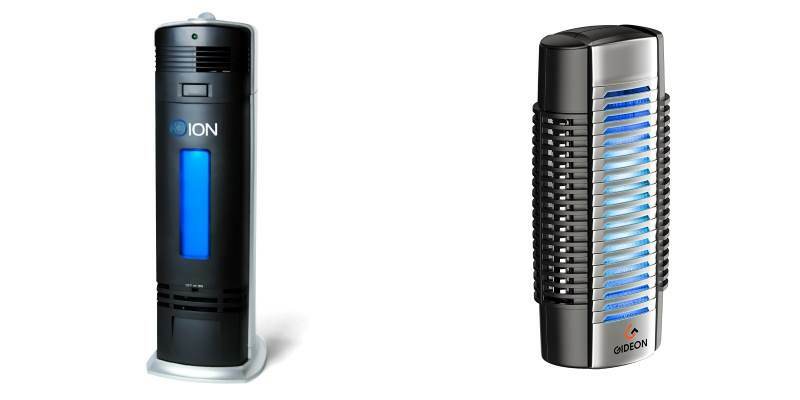 Examples of two popular and commonly sold ionic (ionizer) air purifiers. Left: O-ion B-1000 purifier and (right) the Gideon Plug-In ionizer. Both use charged plates to attract particles from the air which collect in a filter or on plates for later removal. Both also use a fan to move air through the ionizer section of the purifier. Both also have an additional UV-C light feature to kill germs. Air ionizers work by processing air moved by a fan using electrically charged plates to charge air molecules. These ions – or charged air molecules – are attracted to plates or electrodes very much like how static electricity works. Shown: one of many ionizer designs. In this example (of a design used by better ionizer air purifiers) air is moved by a fan through an initial filter. Following this, particles in the air are charged (ionized) and then attracted to metal plates of an opposite charge where they’re captured. A final filter removed some additional particles in the air. Note that not all ionizer air purifiers have filters. Ionizers come a variety of designs. Not all work the same. For example, better models have a fan to circulate air in a room and others don’t. In order to purifier the air in a room a product absolutely must actually move the air through it and process it, remove contaminants. Generally speaking, however, ionic air purifiers use a fan to move air through a series of electrodes and plates. The initial plates using an electrical charge to ionize, or change, the charge of the airborne particles. The 2nd stage features other electrodes or plates which have an opposite charge which these particles are attracted to and will be captured by. It’s very much like static electricity. You may recall how pieces of paper, hair, or styrofoam are attracted to your body and clothes when you build up a charge on carpet. These contaminants collect on plates or similar type of filter where they can be cleaned off later. Some models feature standard filters as well. Sometimes ionizers are a feature built into HEPA type purifiers as an added benefit. One major strength of an ionizer is its ability to destroy airborne illnesses by killing microbes in the air. Unlike ionizers, ozone generators produce a lot of ozone molecules in the air and don’t internally collect contaminant particles. The idea is for ozone to bond with airborne particulates which then fall from the air. They’re not very effective at safe ozone levels and at levels where they are effective, the ozone is potentially harmful to humans. It’s important to cover this topic as unfortunately ionizers are often confused with ozone generators. Companies selling ozone-generating “purifiers” often mislabel them and it simply adds to the confusion. By nature, ionizers do generate a very small amount of ozone, but don’t generally do so at an unsafe or harmful level. 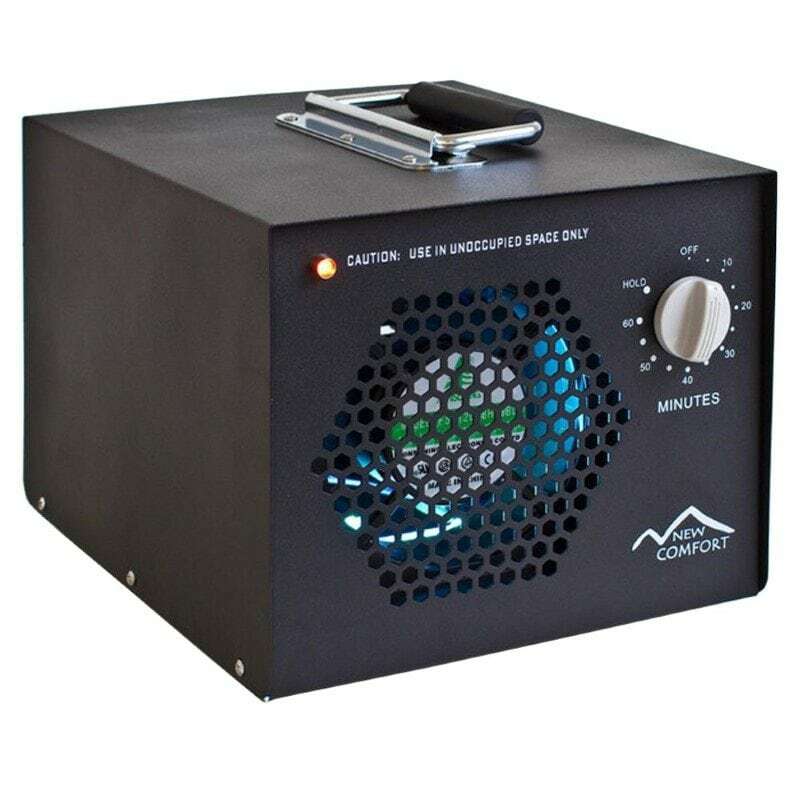 Ozone generators are different from ionizers in that they primarily generate ozone (O3 molecules) by using a high-voltage corona effect to split oxygen molecules in the air which form with other oxygen atoms. They often use a fan to blow these molecules into the room, but more often than not don’t contain internal filters for trapping contaminants. I recommend you avoid these and decide between an ionic purifier and a filter-based (HEPA) purifier. Ozone generators aren’t effective and even if not harmful can irritate your respiratory system. They’re also a bad choice for people with health issues related to emphysema and other conditions. 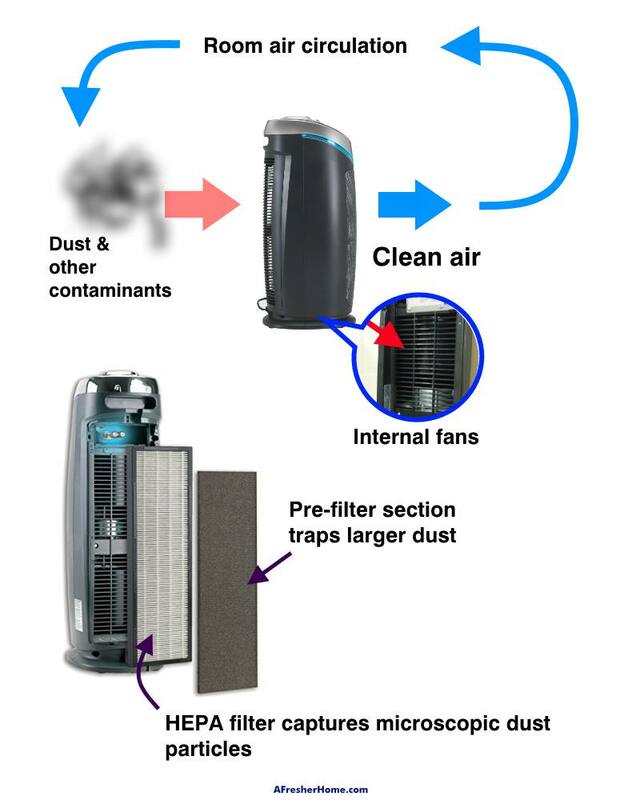 What does a HEPA purifier do? 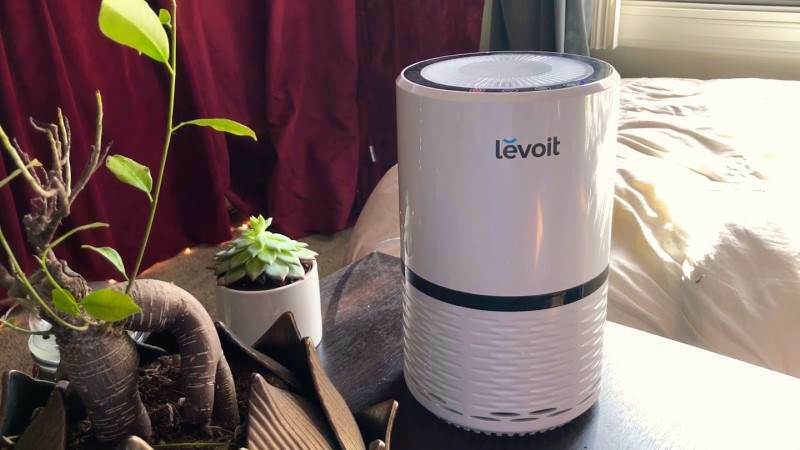 Commonly sold HEPA filter air purifiers like the Levoit LV-H132 are placed in rooms where air quality issues are present. Some of the most common locations are bedrooms and living rooms. They circulate air using fans, moving the air through different filters which traps unwanted elements. Filters are replaced after becoming fully used up. HEPA air purifiers are designed to circulate air in the room and remove contaminants, dust, allergens, and more by trapping them in filters. Unlike ionic purifiers, HEPA purifiers always use a fan – it’s not possible for a product to work without one. Also, they generally do not affect air molecules using any type of electrostatic charge as ionizers do. 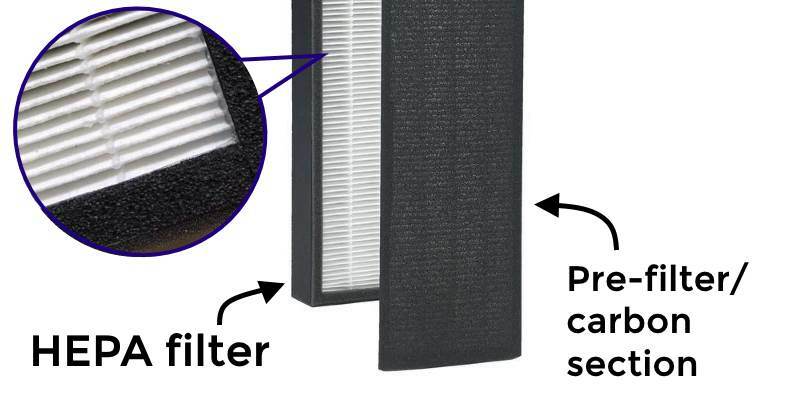 A High Efficiency Particulate Air (HEPA) filter refers to a particular type of filter designed to meet certain efficiency and air purification quality levels. These filters are made of a very dense fiber-like material. The HEPA name is used to describe a standard which mandates a filter can remove airborne particle down to 0.3 microns in size. A micron, or micrometer, is 1/1,000,000 of a meter. The efficiency of this type of filter is 99.97%, meaning that for every 10,000 particles flowing into it only about 3 escape. They’re very effective at cleaning air. HEPA filter-based purifiers don’t produce anything in the air or cause any type of electrostatic charge unlike ionizers. They work off of a simple principle: using a fan or fans to circulate the air in a room and move it through filters. These filters trap both larger and microscopic particles, odors, chemical vapors, and many common household irritants. HEPA filter purifiers are pretty simple in principle although many variations with additional features exist. The most basic design they all share is the use of a fan or fans to draw air in, force it through filters which trap odors and contaminants, and blow out fresh air. They continue to do so in a circulation pattern in order to clean the air in a home or room within a number of hours. Unlike ionizers, they’re heavily reliant upon the movement of air and a filter. While ionizers use electrostatic charge to affect and remove particulates in the air you breathe, these rely on mechanical means. In other words, rather than “attracting” particles in the air, they block and trap them in filters. It’s worth noting that some filter-based purifiers may include unique features like an ultraviolet light (UV) germ killing option. Some may even include an ionizer feature themselves! However they still heavily rely primarily on filters to work effectively. The pre-filter is normally attached to an activated carbon filter section. It’s a thin material that traps larger matter like hair and dust. The activated carbon filter is the portion of an air purifier that absorbs vapors and odors. By now you should understand more about how ionic and HEPA purifiers work. You really shouldn’t spend money until considering the pros and cons of each. In order to make it a bit simpler, I’ve put together a comparison table which highlights the differences between the two along with additional notes. (Some characteristics are often different on a brand & product basis and are not true in call cases). Ionic purifiers do have a distinct advantage over HEPA type purifiers: their ability to sanitize the air and greatly reduce airborne germs which cause illnesses. Filter-type purifiers don’t normally have this ability although some like GermGuardian products do have a feature that uses UV-C technology to do so. Some ionizers like the O-Ion B-1000 in the image above also have this feature, too. 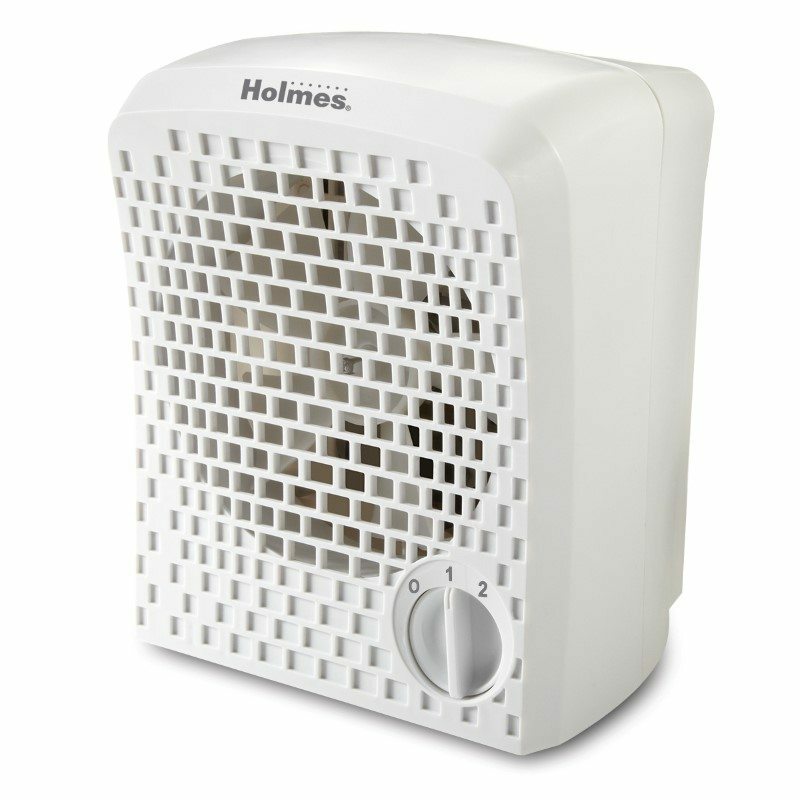 However, when comparing the pros and cons of each, I recommend a quality HEPA-type purifier. They provide a higher rate of air flow for better clean air delivery, they’re much better for dust and hair, and models with a carbon filter can readily absorb odors and chemicals in the air. Another reason is that ionizers often are held to the same standards of performance and demonstrated air cleaning that filter models are. For example, the Clean Air Delivery Rate (CADR) is laboratory tested and proven. It’s a standardized way of demonstrating an air purifier’s cleaning effectiveness. You won’t see that on many, if any, ionic air purifiers. Ionizers are good for light-duty cleaning like needing to freshen a room as well as other less demanding applications. For pet dander, allergies, bad smoke problems, and others HEPA purifiers are the way to go. Additionally, the faster fan speeds mean air cleaning is more rapid and you have more control over it. The major downside of HEPA purifiers is needing to buy replacement filters, which on average is about 6-8 months depending on the model. (Note that in some cases carbon filter can be replaced separately, extending the use of the main HEPA filter section). Some models use both filters and an ionizer in order to provide air cleaning. Note that purification effectiveness can vary greatly, so it’s very important to always buy a proven, effective product. To (unfortunately!) make things more complicated, there are some hybrid models on the market which feature both filter to clean air and a built-in ionizer section as an additional feature. Primarily, however, you should always shop for a purifier on the basis of proven performance, great reviews, and cleaning ability for your room size. Don’t let marketing tactics mislead you into spending money on something that’s less effective. Ionic (ionizer) air purifiers work by moving air. Airborne particles are charged and attracted to plates where they collect on plates or a filter. Ionizers are more effective at sanitizing air. High Efficiency Air Particulate (HEPA) purifiers move air through filters to trap particles, odors, and more. They don’t introduce anything into the air itself. Ozone generators may be misleadingly sold as “ionizers’ but aren’t a good use of money, and aren’t effective. Ozone can irritate internal tissues. At high levels ozone molecules can become harmful. Be sure to do your reading before spending money! One of the best HEPA purifiers sold today is the GermGuardian AC4825. It’s an effective purifier with good performance – and I own one! You can read my detailed review here. If you’d like to see a good ionizer that’s moderately priced, check out the O-Ion B-1000 here as well. Thank you. Your review is the most unbiased I have seen.